I did this walk on 15th July 2006. I drove down to Sandwich and then took the train round to Herne Bay to start the walk some three hours after I had left home! The weather was bright and sunny although there was a very strong wind which was blowing directly into my face for much of the day. At just over 19 miles this was slightly longer than I usually walk however I felt fine at the end and could have gone further if I needed too. This walk can be split into two sections, the first a walk down the coast from Herne Bay to Reculver and the second, longer part, heading across country to Sandwich. The walk down to the seafront from Herne Bay station to re-join the route of the Saxon Shore Way besides Herne Bay pier, photo 1, seemed a lot shorter than when I had walked it in the other direction a couple of weeks ago after walking from Faversham. The path passes along the seafront in Herne bay, passing the clock tower in photo 2, before leaving the road and heading along a promenade, photo 3, that runs besides the beach all the way to Bishopstone. The towers of St Mary's church in Reculver can just be made out on the horizon. At Bishopstone the path leaves the edge of the beach and climbs to the top of the cliffs. Photo 4 was taken looking back from where I had come towards Herne Bay. Heading inland slightly the Saxon Shore Way runs over the top of the cliffs into the Reculver Country Park. On the way I spotted the cooling towers of the Richborough Power station, which the path will eventually pass, on the far horizon, photo 5. The route continues along a broad grassy path through the country park, photo 6, to the towers of St Mary's church. The towers of St Mary's Church, photo 7, at Reculver are the remains of a much larger building that has subsequently been lost to the sea. 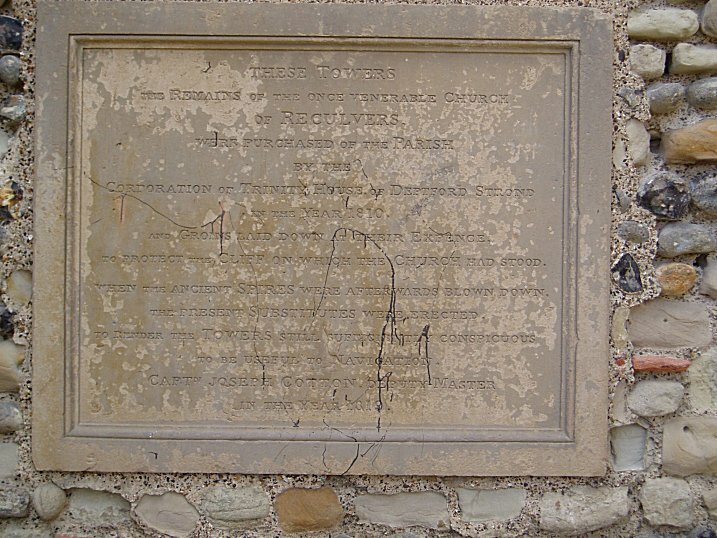 A stone tile on the wall of the church records the following "These towers, the remains of the once venerable chuch of Reculvers were purchased of the parish by the Corporation of Trinity House of Deptford strond in the year 1810. And groynes laid down at their expence to protect the cliff on which the church had stood. When th eancient spires were afterwards blown down, the present substitutes were erected. to render the towers still sufficiently conspicuous to be useful to navigation. Capt'n Joseph Cotton,Deputy Master in the year 1819." Reculver was also the site of a roman fort, the site of which has also been largely destroyed by costal erosion. At Reculver the Saxon Shore Way leaves the coast and begins it journey overland towards the English Channel, running roughly parralel with the edge of the Isle of Thanet which was once separated from the mainland by the Wantsum channel although this had become completely silted up by the middle ages. The path crosses the A28 and heads along quiet lanes, photo 8, and tracks towards Boyden Gate. On the way the path passes through a large newly planted apple orchard, photo 9, one or two of the trees bearing a single fruit. From Boyden Gate the path passes through a couple of fields before continuing along another very quiet lane, photo 10, towards Chitty. Here the Saxon Shore Way leaves the road and heads across fields towards Grove Ferry. On route the path crosses Sarre Penn, photo 11, one of many drainage ditches that cross the marshes, which had a pair of swans swimming on it. The path runs alongside Sarre Penn for a short distance before crossing the field in photo 12 which I think contained a crop of Linseed. At this point the Saxon Shore Way is sharing its route with that of the Wantsum Walk and I took a photo from almost the same spot on that walk, although in far different weather conditions. (Click the green text below the photo to see how the view looked in Oct 2007). From here the route heads down to cross over the A28 before heading over another field and going down a flight of steps to join the road at Grove Ferry. Almost as soon as the path reaches the road it crosses over a level crossing and takes the road bridge over the Great Stour River, photo 13, linking up with the route of the Stour Valley Walk for a short distance. I stopped to eat my sandwiches in the picnic area at besides the river before continuing alongside the River Stour. After a short distance the route leaves the course of the river and heads across a couple of fields, one fo which was planted with onions, photo 14, to join the bank of the Little Stour River, photo 15. Here the route takes a footbridge over the Little Stour before turning to the left to follow the path along the river bank. Up to this point I had been making very good progress but this stretch of path alongside the river had been suprisingly overgrown with some quite uneven ground under the greenery, photo 16, which slowed me down slightly. The path is followed for some distance down to Plucks Gutter where the Little Stour joins the Great Stour River, photo 17. Here the path passes under a road bridge and then continues along the bank of the River Stour for another three miles towards the cooling towers of Richborough power station, photo 18, along a very remote section of path over what was once the Wantsum Channel and is now flat low fields which were mainly being grazed by sheep, surrounded by drainage ditches. The path passes under a railway line and then curves round to the right, still following the banks of the River Stour. Here I finally reached the cooling towers of the Richborough Power Station, photo's 20 and 21, after just under 13 miles walking from where I had first spotted them from the Reculver Country Park. The power station is now disused and the buildings seemed quite derelict, a relic from a different age when it was powered by coal from the nearby Kent coalfields which are also now all closed. Having passed the power station the route still has another couple of miles to go alongside the River Stour before the path finally reaches Sandwich. A little past the power station the route passes the Stonar Cut, photo 22. At this point the Stour flows in a long loop, heading through Sandwich before returning on an almost parallel course. The Stonar cut was constructed in 1776 to link the two stretches of river which are only a few yards apart to alleviate flooding, and I presume once woudl have also been used to shorten the journies of boats using the river when it was used commercially. The path also passes close to the remains of the Roman Fort at Richborough Castle and I left the path to visit the site although when I got there the small museum was shut. Retracing my steps back to the Saxon Shore Way I headed on to pass under the rather noisy A 256 flyover and soon the track besides the river runs up to join a road on the outskirts of Sandwich where the route of the Saxon Shore Way continues straight ahead. Reaching the end of Richborough Road the route turns left for a short distance before turning right along the Butts which is also part of the old town wall of Sandwich, photo 23. The Butts crosses Woodnesborough Road and leads into The Rope Walk, still following the line of the old town wall. On the way I passed a cricket match being played on the ground below the path, photo 24. Reaching New Street I left the old town walls, and the route of the Saxon Shore Way, to make my way the short distance down to the car at Sandwich Station. The GPS made this walk 19.3 miles long. It had been a very pleasant days walking and I was pleased to get this long stage completed.